Three recordings highlighting the 16th century Italian who went to France, Albert de Rippe; pavans from Elizabethan England; and Rolf Lislevand’s latest, taking us into the 17th century. 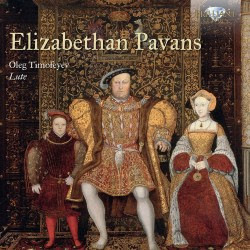 I. Elizabethan Pavans (Oleg Timofeyev, lute). Brilliant Classics CD 95236. From MusicWeb.com: The earliest Pavan recorded here can be dated to about 1540. It’s probably by Henry VIII, the earliest to have been composed in England, as far as we know. The earliest otherwise comes from a collection of 1508 composed by Joan Ambrosio Dalza. The Pavan is often thought of as a slow, processional dance suitable at court for men in bulky clothes and women in large gowns and headdresses but the dance left the court. It became an important compositional form during the 16th and into the 17th centuries when it was probably not expected that it would be an accompaniment to dance. It was written more for listening and for private playing. Although there are various types of pavan, its form - AABBCC - never really changed. Often but not always contrasted with the livelier galliard, the pavan became quite often a serious piece. On this CD we hear pavans played on a lute but there are keyboard examples by John Bull and William Byrd and others. There are other instances of the form for viol consort by Ferrabosco and even by such late figures as John Jenkins (d.1678). This well planned disc takes a variety of examples and put them into roughly chronological order. It begins with Henry VIII and ends with a composer active at the court of James I, John Daniel. When I say variety I am talking forms. I hadn’t really thought that there were so many openings for composers in this direction. Lacrimae Pavan, perhaps the most famous example, by Dowland, is in three definite, even contrasted sections. The same applies to the beautiful Semper Dowland, Semper dolens. Both the underrated Daniel Bachelor and John Daniel (brother of playwright Samuel) ran with Dowland’s mantle and wrote even longer, more complex Pavans during the Jacobean age. These are the longest on the disc and end it. Some pavans were for dancing and these include the Passamezzo Pavan or the ‘Passing Measures Pavan’ which gets a mention in ‘Twelfth Night’. These tend to be anonymous and are built around a ground bass or, anyway a set of harmonic progressions. Some pavans are what Oleg Timofeyev describes, in his fascinating booklet notes, as ‘Rhapsodic Pavans’. These are in the usual three sections but the sections do not necessarily relate and are free melodically to go their own way. He mentions Ferrabosco’s Pavan in this context. The Spanish Pavans of which the ones by John Johnson and Thomas Robinson are good examples are often variation sets rather than dances. Another, the mysterious Mason Pavan by the otherwise unknown Mathias Mason is in the ‘sweet’ major key. For Oleg Timofeyev this project has been a labour of love developing for over twenty years. One wonders why no one has thought of it before and it came out of a paper he wrote whilst a student entitled ‘The English Pavan - A Vocabulary of Gestures’. The thesis found him searching through long forgotten manuscripts like the Marsh Lute Book. This CD is the result of his studies, and who knows, another may emerge. He is closely recorded but with adequate space around the sound. He plays a bright-sounding 10-course lute made by Ray Nurse in 1984. It is based on a model by the sixteenth century maker Hans Frei some of whose instruments can still be found. II. Albert de Rippe (c.1500-1551). (Gabriele Palomba,, lute). Stradivarius CD STR 33928. 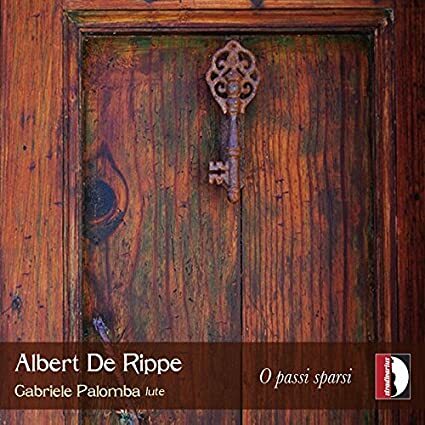 Albert de Rippe (Alberto da Ripa) (c. 1500–1551) was an Italian lutenist and composer. He was known variously as: Alberto da Mantova, Alberto Mantovano, Alberto da Ripa, Albert de Rebe, Albert de Mantoue, Albert Ripae and Albert de Rippe. He was born in Ripa di Suzzara in the province of Mantua but the date remains unclear. Some scholars place it around the period of 1470-1480, others, and perhaps more likely, suggest 1500. He worked in Mantua before 1528, when he left for France. There, he joined the court of Francis I. De Rippe was evidently held in great esteem at the court, as his annual salary was double that of any other lutenist, and he also frequently received gifts of land, money, wine, etc., and various other benefits. He only published three works during his lifetime, but six volumes of his music were published posthumously by his pupil, Guillaume de Morlaye. That edition was titled, and is now sometimes referred to as, tab(u)lature de leut. The extraordinary celebrity that Alberto da Mantova now enjoyed meant a universal recognition and his name was regularly associated with the Divine Francesco da Milano. A recognition confirmed by the fact that in 1574 Phalese, in the publication “Thesaurus Musicus”, reprinted six of our maestro’s fantasies. These very particular pieces by Albert de Rippe have unique characteristics for this the first half of the 16th century. De Rippe's oeuvre consists of 26 fantasias, 59 intabulations (46 chansons, 10 motets and 3 madrigals) and 10 dances, all for six-course lute, and 2 fantasias for four-course Renaissance guitar. The lute fantasias are now considered his most important works: they represent a novel type for the time, of purely instrumental composition. Their dense polyphony and complex architecture (some evolve for several hundred bars), as well as the skill required to play them, make the fantasias some of the most important works in the repertoire. III. La Mascarade (Rolf Lislevand, theorbo & baroque guitar). ECM CD 2228. From AllMusic.com: The Norwegian early music lutenist and guitarist Rolf Lislevand has pooh-poohed the idea of historical authenticity, but it may be that the lovely program here would have appealed to listeners in the court of Louis XIV, for which the music was intended. Lislevand examines pieces by a pair of late 17th century composers, Robert de Visée (a rondeau by whom, plus some rather murky booklet ruminations by Lislevand, give the album its title) and the sparsely heard Francesco Corbetta, choosing slow, quasi-improvisatory pieces and dances -- preludes, chaconnes, sarabandes, passacaglias -- from each, and adding some improvised introductions. The music alternates between a very deep-voiced, many-stringed theorbo and a small, crystalline Baroque guitar. The result is an extremely reflective concert, dividing up a common stock of musical ideas in several subtle ways, that, as Lislevand points out, would have been played for a small group of connoisseurs in its own time. ECM producer Manfred Eicher is nonpareil as a recorder of music like this, but here, working in the Auditorio Stelio Molo in Lugano, he outdoes himself, evoking the "musica callada," the music that has fallen silent, of Mompou. He draws the listener into a rich communion with a remarkable player. From Gramophone: Baroque guitarists Francesco Corbetta and his pupil Robert de Visée were masters of chiaroscuro, of nuance, suggestion and – unintentionally – irony, exploiting the resources of their delicate instruments in intimate spaces to express the full grandeur of the monarchs they served. Yet their lives couldn’t have been more different. Corbetta (c1615-81), that great innovator and populariser of the five-course guitar, was born in Italy and worked there as well as in Spain, the Low Countries, England and finally France. The career of French-born multi-instrumentalist de Visée, 30 years Corbetta’s junior, was wholly centred on the French court. Their music makes extensive use of the typical French dance suite (which, incidentally, Corbetta helped ‘codify’). But where Corbetta’s work relies on a profusion of ornamentation, contrasting effects and the so-called ‘mixed style’ of strumming and plucking, de Visée’s – at least for the theorbo – tends towards the melodic simplicity and grandiose utterance of Lully. That’s not to say one is superficial, the other serious; both exhibit charm and profundity in equal measure. But it takes a performer of the calibre of Baroque guitarist and theorbo player Rolf Lislevand fully to realise the synecdochal power of their music for modern ears. On ‘La Mascarade’, Lislevand provocatively contrasts the music of Corbetta and de Visée not just by focusing on guitar pieces by the former and theorbo pieces by the latter but by eschewing the suite proper in favour of (mostly) pairs of preludes or similar and chaconnes or similar. The effect is hypnotic, dazzling and even dizzying as Lislevand conjures up lost châteaux, parterres and the intrigues that took place therein through the merest flick of the right-hand wrist or finely judged fall of a left-hand finger. The resultant theatre of sound, resonant with percussive strumming, gales of trills, overlapping campanella scales and mournful ports de voix finds yet another analogue in the differences between the lightly built Baroque guitar and the large, long-necked theorbo.